I hold a Ph.D. in Anthropology (1973) from the University of California, Berkeley and have taught in the Department of Anthropology at the University of Washington since 1972. My primary expertise is in ethnobiology, which is the ethnographic study of human relationships with the natural environment. In my research I rely heavily on the analysis of linguistic evidence to establish how the natural environment is conceptualized within particular cultures. Though my training is not as a linguist, per se, my doctoral dissertation was completed under the direction of Brent Berlin and Paul Kay, two outstanding linguistic anthropologists, and I have published in the International Journal of American Linguistics, the Journal of Linguistic Anthropology, and the International Encyclopedia of Linguistics. I have served on the editorial board of the Journal of Linguistic Anthropology. With respect to the cultural region under consideration here, I have conducted ethnographic, historical, ecological, and linguistic research in the Columbia Plateau continuously since 1975. I co-authored Nch'i-Wána "The Big River": Mid-Columbia Indians and Their Land (1990) with my Yakama colleague and teacher, James Selam, and have published numerous articles on Plateau ecology, language, and culture during the past 25 years, including two chapters I co-authored for the Plateau volume (1998) of the Smithsonian Institution's Handbook of North American Indians. The remains were found in shallow water along the edge of the Columbia River. It is believed that the remains eroded from the river bank at Columbia Park in what now is Kennewick, Washington, in July 1996. Preliminary C14 dating of the bone suggested the remains might be approximately 9,000 (C14) years old. At issue is the application of provisions of NAGPRA with regard to the repatriation of the remains to a coalition of tribes and bands (Confederated Tribes of the Colville Reservation, Washington; Confederated Tribes of the Umatilla Reservation, Oregon; Confederated Tribes and Bands of the Yakama Indian Nation of the Yakama Reservation, Washington; Nez Perce Tribe of Idaho; and the Wanapum Band, a non-Federally recognized Indian group) that claims them. In particular, I will address the issue whether or not those remains can be shown to be "culturally affiliated" with any contemporary Native American group, specifically with any or all of the intervenor groups. For present purposes, "Cultural affiliation means that there is a relationship of shared group identity which can be reasonably traced historically or prehistorically between members of a modern-day Indian tribe and an identifiable earlier group. Cultural affiliation is established when the preponderance of the evidence--based on geographical, kinship, biological, archeological, linguistic, folklore, oral tradition, historical evidence, or other information or expert opinion--reasonably leads to such a conclusion." (43 CFR 10.2(e)). I believe that "cultural affiliation" requires a direct link via traditional means of transmission of "that complex whole which includes knowledge, belief, art, morals, law, custom, and any other capabilities and habits acquired by man as a member of society" (Tylor 1871:1). This includes language both as a part of culture and as the primary means for its transmission, while recognizing that culture and language "are not necessarily correlated" (Sapir 1921:212-220). Culture also should be understood as a means of human adaptation, and thus will correspond in many ways to the particular habitat and means of subsistence of the social group. Julian Steward identified what he called the "cultural core" as, "The constellation of features which are most closely related to subsistence activities and economic arrangements. The core includes such social, political, and religious patterns as are empirically determined to be closely connected with these arrangements.. (1955:37). I will focus on evidence for linguistic continuities or discontinuities, on the one hand, and for linguistic evidence of continuities or discontinuities in features of the "cultural core." As I have noted above, continuities in the cultural core are to be expected as a consequence of a group's continuous occupation of a common habitat while conserving basic technological and economic means. To the extent that the evidence suggests continuites rather than discontinuites, the evidence "reasonably leads to [such] a conlcusion" of "cultural affiliation." I will describe how Indian people of the Columbia Plateau identify themselves as members of local groups in the Sahaptin language. I will show that the most common identification is as a member of a village community, rather than as a member of a larger "tribal," language, or regional group. I will then describe the named village groups known to have occupied the territory immediately adjacent to where the Kennewick remains were found at first European contact, in particular, as noted by Lewis and Clark in 1805-1806 (Moulton 1988, 1991) and David Thompson in 1811 (Glover 1962). I will summarize the known distribution of Indian languages in the broader Plateau region at that time and will present evidence that the language linguists call Sahaptin was the primary first language of the residents of the villages adjacent to the Kennewick Man site at first Euroamerican contact. I will then consider linguistic evidence that Sahaptin-speakers were intimately familiar with the flora and fauna characteristic of the central Columbia Plateau habitat surrounding the Kennewick Man site. I will also briefly summarize the known distribution of Sahaptin place names, which is further evidence that Sahaptin-speaking peoples had lived in this area for a long time when the first Euroamericans arrived. I will then consider published assertions to the contrary, i.e., suggestions that Sahaptin-speaking peoples were relatively recent colonists of the Columbia Plateau region. In particular, I will argue against the Teit-Berreman hypothesis that Sahaptin-speaking peoples were pushed north from the northern Great Basin by expanding Numic speakers in the 18th century, and that they then displaced prior Interior Salishan occupants of the zone. This hypothesis has been carefully refuted by a number of experts on Plateau ethnography, ethnohistory, and language. "linguistic paleontology," used to determine pre-historic habitats of speech communities associated with reconstructed proto-languages by reconstructing particular vocabulary items that name locally endemic plants and animals. I will summarize the application of these methods to the linguistic evidence relevant to the determination of the possible and/or probable linguistic affiliations of the "earlier group" to which Kennewick Man belonged. I will argue that proto-Sahaptian (ancestral to modern Sahaptin, Nez Perce, and possibly Klamath/Modoc) was most likely spoken along the lower middle Columbia River near the Kennewick Man site at least 2,000 years ago. I will argue that other languages of this region -- in particular, the Athabaskan Nicola language, the seven Interior Salishan languages, the Kootenai language, the Numic languages, and Kiksht, a Chinookan language -- spread into the region after proto-Sahaptian was established here (see Map 1). I will also discuss the now extinct Cayuse and Molala languages, which may have had wider regional distributions in the past. I will argue that taken together this evidence strongly favors the view that proto-Sahaptian or some immediate genetic predecessor was spoken throughout the Columbia Plateau approximately 4,000 years ago. I will then review Joseph Greenberg's (1987) controversial claim that all American Indian languages, with the exception of his Na-Dene and Eskimo-Aleut groups, form a single "genetic unit," which he calls Amerind. Proto-Amerind would have been the language of the "Clovis" peoples, dated to approximately 12,000 years ago. This group includes proto-Sahaptian as a member of a large, long-recognized linguistic phylum known as Penutian. Penutian is accepted as a valid genetic unit by such local experts as Bruce Rigsby. According to Greenberg, it includes in addition to Sahaptian (with Klamath/Modoc), Tsimshian, Chinookan, Kalapuyan and other "Oregon Penutian" languages, the California Penutian languages, the Gulf languages (located mostly in the southeastern United States), and the Mixe-Zoque and Mayan languages in southern Mesoamerica. This group is estimated to be older than Indo-European, which is believed to be approximately 7,000 years old. Thus Proto-Penutian might have been spoken 8,000 or more years ago. I will argue that the distribution of modern-day Penutian languages favors the view that proto-Penutian was spoken somewhere in the region between central California and the Columbia Plateau. It is thus more than likely that Kennewick Man spoke a proto-Penutian dialect. If this is true, the continuity of occupation of descendant speakers of the Columbia Basin habitat by means of the exploitation of local resources, most notably salmon and roots, supports the assertion that Kennewick Man is most likely culturally affiliated more closely with historic Sahaptin-speaking peoples of this region than with any other known Native American group. Finally, I note that a prominent summit immediately west of Kennewick at the east end of Rattlesnake Ridge, known in Sahaptin as Lalíik, is a sacred site to the contemporary Indian people of the Yakama and Umatilla Nations. Elders interpret the name of this summit as describing how it rose above the waters of a great and ancient flood. Perhaps coincidentally, it is known that a series of massive floods occurred here during the last advance of the Pleistocene ice sheets. These "Bretz floods" briefly filled the Columbia Basin upstream from Wallula Gap to a depth of 1,000 feet, with Lalíik standing above as an isolated peninsula. The last of these great floods is thought to have occurred 12,800 years ago (Allen, Burns, and Sargent 1986:103). I conclude with a question: Could this summit so aptly named in Sahaptin have sheltered ancestors of present-day Indians 4,000 years before Kennewick Man is thought to have passed on? Map 1. Distribution of Language Groups in the Pacific Northwest (Hunn and Selam 1990:60). Reproduced courtesy of the University of Washington Press. Which Indians Groups Lived Near the Site at First Euroamerican Contact? There is a broad consensus among anthropologists that prior to 1855 (when treaties were negotiated with the Indian peoples of this region), local Indian peoples were not organized into "tribes," that is, there were no political units encompassing several to many villages with a common identity, sense of purpose, or territorial claim. Rather, people identified first of all as members of a particular village community with which they were associated by birth and/or by having been raised there (Ray 1936:111-112; Rigsby 1965:29; Schuster 1975:34, 41-44; Hunn & Selam 1990:211-214). Individuals also might identify themselves as speakers of a common language or dialect. In Columbia River Sahaptin, the local language was refered to as chiskin, literally, 'this way of speaking'. For contemporary speakers at least, sharing "this way of speaking" is fundamental to the recognition of "a shared group identity." It is necessary to address here a persistent problem in Plateau ethnography relevant to the question of "a shared group identity." Anthropologists and other commentators (including treaty negotiators) have applied terms which originally referred to specific village groups to larger groupings, attributing a spurious unity to the larger units so designated. A case in point is "Palouse." The Palouse are often spoken of as a Plateau "tribe" (cf. Sprague 1998 in the HNAI) inclusive of all Sahaptin-speaking Indians resident on the Snake River at and above its mouth. It is in this sense that the "Palouse" count as one of the 14 Confederated Tribes and Bands of the Yakama Nation. However, Rigsby (following Jacobs) argues that the term properly applies only to Indian people identified with the village of Pelúus (Palúus in other Sahaptin dialects) located historically at the junction of the Snake and Palouse Rivers. Rigsby (1965:38-40) restricts the Palus dialect of Northeastern Sahaptin to that village and mixed Palus-Nez Perce villages located upstream as far as Alpowa. He specifically distinguishes the Palus dialect from what he calls the Lower Snake River dialect (naxiyamláma), spoken at Wawyuk'má, K'wsís, and Chamná villages. These are located respectively on the Snake River at Fishhook Bend and on the Columbia at the mouths of the Snake and Yakima Rivers. He bases his conclusion on personal interviews with Indians who were raised in these villages. In short, there is no evidence of "a shared ["Palus"] group identity" inclusive of all Snake River Sahaptins. The same arbitrary extension of reference from the people of a single village to those living along a whole stretch of river may be observed with the terms "Walla Walla" and "Tenino" (cf. Stern 1998, Hunn and French 1998). I believe it is reasonable to assume that the fundamental bases for the recognition of shared group identities at first Euroamerican contact are likely essentially the same as those basic to defining that "earlier group" with which Kennewick Man would have identified. In particular, this "earlier group" would not have been a "tribe" in the sense defined above, since such "tribes" are characteristic of more densely and permanently settled groups than there is reason to suspect occupied the Columbia Plateau at any time during the past 12,000 years. If we are to identify an "earlier group" with "a shared group identity" attributable to Kennewick Man's, that would be a local residential group similar to the historic village or villages located nearest the site where his bones were recovered or an ancestral group sharing a "way of speaking." The site where the remains were found is on the boundary between the ceded areas of two treaty tribes, the Confederated Tribes of the Umatilla Reservation and the Confederated Tribes and Bands of the Yakama Indian Nation. Specifically, the boundary described in the treaties with those tribes runs down the middle of the Columbia River past the Kennewick Man site. The remains were located on the right bank (facing downstream) in the ceded area of the Confederated Tribes of the Umatilla Reservation, however, the historic, ethnographic, and linguistic evidence indicates that this treaty boundary does not reflect any locally-relevant political or cultural distinction. As noted above, it is generally agreed among anthropologists who have worked in this area that contemporary "tribes" were created by the treaty process (in 1855) and that they do not correspond to pre-contact Native groupings. Rather, it is agreed that the Native American peoples of the Columbia Plateau region were organized by and identified with politically independent villages (Ray 1936:111-112; Rigsby 1965:29; Hunn and Selam 1990:211-214). Local groups so-defined were typically named (in Sahaptin) by appending a suffix meaning 'person/people of' to the village name, e.g., sk'in-láma or sk'ín-pam 'people of the village of Sk'ín [literally 'cradle-board']', located at the foot of Celilo Falls; cf. the "Skin-pah," one of the fourteen tribes and bands signatory to the Yakama treaty (cf. Schuster 1975:41-44). The Kennewick Man site is most closely associated with contact-period Native American groups referred to by Lewis and Clark (October 17, 1805) as "Cho-pun-nish," "So-kulk," and "Chim-nâ-pum" (Moulton 1988:287). "Names of this nation above the mouth of the Ki-moo-e-nim [Snake River] is So-kulk Perced noses. The Names of the nation on the Kimoenim River is Cho-pun-nish Pierce noses at the Prarie the name of a nation at the Second forks of the Tape tete [Yakima] River, or Nocktock fork Chim-nâ-pum, Some of which reside with the So kulks above this." (Moulton 1988:292). The "Cho-pun-nish" properly applies to the Nez Perce only (Aoki 1967). There is disagreement as to the proper identity of the "So-kulks." Some scholars equate them with the contemporary Wanapum community centered at Priest Rapids (Schuster 1975:31), understood to include residents of villages downstream at White Bluffs and Hanford (Relander 1986 :301-305). However, it has been suggested that "So-kulk" is a corruption of shkúlkul, Sahaptin name for a variety of the edible root Lomatium canbyi that is particularly associated with the Wanapam community at Priest Rapid (Hunn and French 1981). Others equate them with the residents of the historic village of Kw'sís, at the mouth of the Snake River (Rigsby 1965:39-40; Moulton 1988:284). The "Chim-nâ-pum" are the people of the village of Chamná, described below, a group distinct from the Yakama proper that occupy the Yakima River above Horn Dam. Lewis and Clark were met on their arrival at the mouth of the Snake River on the Columbia by a chief (subsequently named "Great Chief Cuts-Sâh- nim" [Moulton 1988:294]) and 200 men from a village ¼ mile up the Columbia from the mouth of the Snake (Moulton 1988, vol. 5, pg. 278). This is certainly the historic village of Kw'sís, identified with Lewis & Clark's So-kulks by Rigsby 1965:39-40. The village name is spelled variously, e.g., "Kosith" by Relander 1986:296; "k'u'sis" by Ray 1936:144; Qosispah by Trafzer and Scheuerman 1986:4-6, and its residents have been variously identified as "Yakima" (Ray 1936:144), "Palouse" (Trafzer and Scheuerman 1986:4-6), and as naxiyamláma (Rigsby 1965:39-40). Ray subsequently changed his view to accord with Rigsby's, while I have already criticized above the broad use of the term "Palouse" employed by Trafzer and Scheuerman. All these peoples were clearly identified as speakers of Sahaptian languages (Sahaptin and Nez Perce). Rigsby quotes Meriwether Lewis as follows: "The language of both of these nations [Sokulk and Chimnapum], of which we obtained a vocabulary, differs but little from each other, or from that of the Choppunish who inhabit the Kooskooskee [the Clearwater River] and Lewis's River [the Snake River]" (1965:25). The next European explorer to travel past this point was David Thompson. He identified the Indians he encountered on the Columbia River between the mouths of the Yakima and the Snake Rivers (July 9, 1811) as "Skaemena" (Glover 1962:349), which is most likely an alternate spelling of Chamná. In July 1811 the "Skaemena" were living at a village on the banks of the Columbia River just upstream from the mouth of the Snake. This village would have been nearly immediately opposite the Kennewick Man site and may have represented a summer fishing camp associated with the primary village of the chamná-pam, which, as noted above, was located a few miles upstream of the site Thompson describes. The village known as Chamná is located at a later date on the Columbia River at the mouth of the Yakima River (Relander 1986:299-300). The people of that village were known in the Sahaptin language as chamná-pam' people of Chamná'. It is clear that this village group is equivalent to Lewis and Clark's "Chim-nâ-pum" and Thompson's "Skaemena." Bruce Rigsby classifies this group, as well as residents of the village of Kw'sís (the Sokulks?) in his Lower Snake River dialect group (naxíyampam or naxiyamláma) within his Northeast Sahaptin dialect cluster of the Sahaptin language (1965:39-40). Descendants of individuals who lived in these two villages are now enrolled with the Yakama and Umatilla Tribes. In sum, the earliest historic records clearly identify Sahaptin-speaking peoples in the area of the Kennewick Man site and that these people are affiliated with village communities with which contemporary Umatillas, Yakamas, and Wanapams are linked. I will evaluate the linguistic evidence that might establish a connection between these contemporary people and a community resident at the same location some 9,000 years ago, a community to which Kennewick Man presumably belonged. The existence of a name for a plant, animal, or place in a given language may be taken as proof that that plant, animal, or place was of cultural significance to people speaking that language (Hunn 1982). 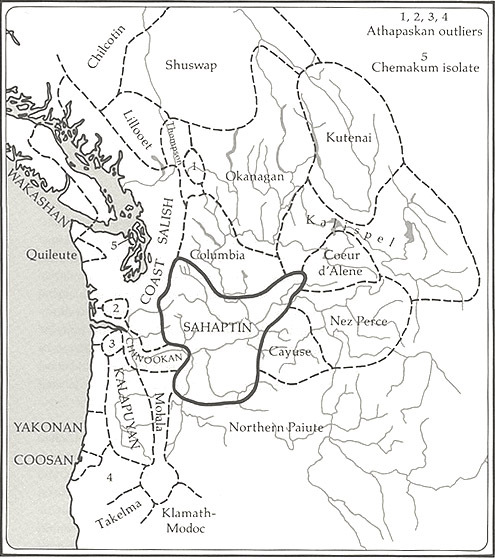 An examination of contemporary Sahaptin vocabulary for plants and animals (Hunn and Selam 1990) and a consideration of the corpus of Sahaptin place names (Hunn 1996, Hunn n.d. 1) demonstrates that Sahaptin-speakers were intimately familiar with environmental features distinctive of the Columbia Plateau habitat. I may add that key features of the Plateau environment have changed little during the past 12,000 years, since the end of the last ice advance (Chatters 1998:42-48). In sum, Kennewick Man lived in much the same natural environment familiar to contact-period Plateau Indians. Sahaptin has a highly differentiated ichthyological vocabulary (Hunn 1980). In particular, every salmon species of the Columbia River basin is named. In fact, Sahaptin distinguishes populations within species, e.g., jack Chinook (Oncorhynchus tschawytscha) and jack blueback salmon (O. nerka), which spawn a year early. These are named by a diminutive form of the species name. This indicates an intimate familiarity with distinctive adaptive strategies of Columbia River salmonids (Landeen and Pinkham 1999). Sahaptin also distinguishes between large-scale and bridge-lip suckers. Catostomus columbianus is yáyk, C. macrocheilus is xúun. It is noteworthy that C. columbianus is endemic to the Columbia and Fraser River systems east of the Cascades. The Sahaptin name for local fresh-water mussels (xistú or siwáala, depending on the dialect), an important resource prehistorically in the Plateau (Lyman 1984), is "authentically" Sahaptin, in contrast to the Sahaptin term for salt-water clams (sháxu), which is a loan from Puget Salish (Hunn 1999:8). Sahaptin has a term for "seal" (harbor seals and/or sea lion species), wálchayu, which appears of greater antiquity than the Sahaptin term for "shark/whale," sutsxlá 'splitter', which is transparently descriptive (often a sign of recent coinage) (Hunn and Selam 1990:315, 328). Seals were hunted at the foot of Celilo Falls within traditional Sahaptin territory, while sharks and whales, of course, we not part of normal Sahaptin direct environmental experience. Sahaptin distinguishes two varieties of mule deer as yáamash (the Rocky Mountain mule deer) and tl'álk (the black-tailed deer of the Cascade Mountains), as well as the white-tailed deer, mountain goat, bighorn sheep, and pronghorn antelope (Hunn and Selam 1990:139-141). There are few places in the world where these animals occur in close proximity. Sahaptin vocabulary is thus shown to be peculiarly adapted to its historic location and habitat. By contrast, there is no Sahaptin term for caribou and the term for moose (shashík) is likely borrowed from Interior Salish through Nez Perce (cf. Aoki 1994:624). Similarly, bison are known as músmustsin or tsúulim, loans from Cree and Flathead respectively. This suggests that Sahaptin was not spoken, at least not at all recently, much to the north or east of its historic location. The prominence and apparent antiquity of terms for rattlesnake (waxpúsh), burrowing owl (papú), yellow-bellied marmot (chikchíknu), Western gray squirrel (qánqan), and tick (ách'pl) all point to a long-term association of Sahaptin with the semi-arid Plateau environment, as these species are limited in distribution west of the Cascades and north of the Canadian border. A nearly obsolete Sahaptin term for the California Condor, pachanahú, further bounds the traditional Sahaptin habitat, as the northern limit of the condor's historic range was the Columbia Gorge (Hunn and Selam 1990:311-332). It is noteworthy that Coyote (spilyáy) is the Sahaptin "culture hero," not Raven, as is characteristic of cultures to the north and west (Jacobs 1929, 1934; Beavert 1974). Sahaptin people consider the golden eagle of far greater mythological significance than the bald eagle (Hunn and Selam 1990:146-147), which matches the relative prominence of golden and bald eagles in the Columbia Plateau. Plant names likewise demonstrate that Sahaptin has long been spoken by people living at or near their historic locations. The elaborate Sahaptin terminology for species of the genus Lomatium (Apiaceae). Lomatiums are key staples for Columbia Plateau peoples. Sahaptin-speakers recognize and use more such species than any other Plateau people (Hunn and French 1981, Hunn and Selam 1990:170-177). Several lomatiums named in Sahaptin are endemic to the Columbia Plateau (e.g., Lomatium canbyi, L. columbianum, L. cous, L. farinosum var. farinosum, L. farinosum var. hambleniae, L. gormanii, L. minus, L. piperi, L. salmoniflorum). A related endemic species with a highly restricted range, Tauschia hooveri, called pank'ú in Sahaptin, is widely sought after by Plateau Indians. Vantage, Washington, at the historic boundary of Sahaptin and Columbia Salish territory, is named for this species (Relander 1986:312-313), which reaches its northern limit at that point (Hitchcock and Cronquist 1973:338; Hunn and Selam 1990:172). Lexical gaps provide additional evidence for the habitat specificity of Sahaptin language and culture. Arrowhead (Sagittaria), better known locally as "wapato," a key staple of Indians living west of the Cascades on the Columbia, is not recognized in Sahaptin. Likewise, "wokas," the yellow pond-lily (Nuphar polysepala), key staple of Klamath peoples in south-central Oregon, is known in Sahaptin as kalamát, like a corruption of "Klamath." In other words, two key staple foods of neighboring groups to the south and west do not have "old" Sahaptin names. Maize, staple of the agricultural economies on the lower Missouri River and in the Southwest, is known in Sahaptin as sit'xws-wáakul, literally, "resembles hyacinth brodiaea." Hyacinth brodiaea (Brodiaea hyacinthina) is a favorite Sahaptin root food common in the Pacific Northwest. Maize, apparently, was unknown to Sahaptin-speakers until recent times. The peachleaf willow (Salix amygdaloides) is singled out as haháw, distinguished from all other willow species. It was preferred as the frame for Columbia River winter lodges, just as the "lodgepole pine" was preferred for Indian lodges east of the Rocky Mountains. Peachleaf willow is largely restricted to the banks of the lower middle Columbia River in eastern Washington, again suggestive of the specificity of Sahaptin habitat associations. Several place names on the lower middle Columbia River are named for this plant (Hunn n.d. 1). I have compiled an inventory of 1,100 Sahaptin place names (Hunn n.d. 1). They are without exception names for places within or on the margins of the historic Sahaptin range (Hunn 1996). While many names have been lost, those that we can map accurately at this late date demonstrate the Sahaptin cultural focus on riverine resources (as well as certain montane environments), as we might expect given the importance of fishing as a subsistence resource for Plateau peoples documented over the past 10,000 years (Hewes 1998). Most Sahaptin place names describe some salient feature of the site named. However, the transparent descriptive quality of these names does not indicate that they are recent inventions, as has been argued for European place names (Hill n.d., Hunn n.d. 2). In fact, it is an article of faith that places were named by Coyote before the arrival of the first people (Jacobs 1934). Can we judge the antiquity of the Sahaptin occupation of the Columbia Plateau from features of Sahaptin place names? Quite recent population movements may be traced by analyzing the provenience of local names, as Kinkade has done for Salishan place names in the Methow Valley (tributary to the Columbia just downstream of the Okanogan River). He was able to show that many Methow place names were originally from the Okanagan-Colville language, though the historic occupants of the valley spoke Columbia Salish (1967). However, Kinkade estimated that the displacement of Okanagan-Colville by Columbia Salish occurred within the past few hundred years. The fact that most recorded place names for the Warm Springs Reservation are clearly Sahaptin argues against the theory of the ethnographer, George Murdock, who claimed that that area was controlled by Northern Paiute peoples until the 18th century (Murdock 1938). French and Rigsby (Rigsby 1969) adduce additional evidence that there was no such recent population shift. In sum, I find no evidence in Sahaptin environmental vocabulary to support the view that Sahaptin occupation of the Columbia Basin habitat is recent. However, it is not possible to state with certainty that these place names demonstrate local occupation of the area beyond several hundred years past. The weight of the evidence from the consideration above of the Sahaptin environmental lexicon contradicts one once popular hypothesis of recent population shifts in this region. This is the claim first published by James A. Teit (1928) and later repeated with elaborations by Joel V. Berreman (1937). Teit reported that several of his Columbia Salish consultants asserted that Columbia Salish-speaking Indians occupied the entire Columbia River region downstream as far as the Dalles in the mid-18th century, citing supposed "Salish" place names in what is historic Sahaptin territory. Rigsby refers to this as "the Teit-Berreman hypothesis." He is at pains to refute it (1965:221-228), as were Verne Ray (1938) and George Peter Murdock (1938) thirty years earlier. I need not restate their objections here, but only note that my own data on Sahaptin plant, animal, and place names, summarized above, provide no support whatsoever for the view that Sahaptin is recently intrusive in the Plateau. I will argue that it is theoretically possible to establish "cultural affiliations" across the 9,000 years that separate contemporary Native American groups from the "earlier group" to which Kennewick Man belonged by means of widely accepted historical linguistic methods. Of course, other thing being equal, the greater the temporal separation, the harder it is to establish to the satisfaction of most experts such an affiliation. However, it is also the case that the pace of cultural change is not everywhere and always the same. Thus, under certain circumstances - in particular, where the evidence suggests residential continuity and the maintenance of basic demographic, technological, and hence ecological patterns - there may be less cultural discontinuity over 9,000 years than in 90 years in other contexts, such as in modern industrial society. It should be noted that "linguistic affiliation" is not equivalent to "cultural affiliation," though language and culture are closely connected. As noted above, though language is both an aspect of culture and the means by which cultures are understood and transmitted from generation to generation, there are many contemporary examples of peoples that share a language but whose cultures are quite different (Sapir 1921:212-220), e.g., Mexican Indians who speak only Spanish. There are also examples of neighboring communities that speak very different languages yet share basic cultural orientations as a consequence of close and long-established contact and shared ecological adaptations (Bright and Bright 1965). However, if a contemporary group can be shown 1) to be linguistically affiliated with an earlier group and 2) to occupy the ancestral habitat of that earlier group by similar technical means, these factors would support an inference of shared group identity between the earlier group and the modern group. Watkins argues that, "The methods of historical linguistics provide critically important tools for the culture historian concerned with the reconstruction of ancient ways of life.. A language necessarily implies a society, a speech community, and a culture; a proto-language [that is, a hypothetical ancestral language reconstructed on the basis of comparisons of contemporary "daughter" languages, ESH] implies a 'proto-culture' -- the culture of the users of the proto-language." Furthermore, "Reconstructed lexicon [i.e., vocabulary, words and their associated meanings, ESH] is indispensable when archaeological evidence is lacking or ambiguous" (Watkins 1992a: vol. 1, pg. 318). Rigsby adds that, ". linguists. have powerful methods and techniques for probing the pasts of people who have left no written records." (1996:141). What are these methods and how might they be used to address the present question? First, by evaluating similarities and differences among sets of contemporary languages one may confidently establish a "genetic" language classification which consists of a hierarchy of genetic units: "By a valid genetic unit is meant a [language] group at any level whose members are closer to each other genetically [that is, relationship due to descent from a common ancestral form, ESH] than to any form of speech outside the group" (Greenberg 1987:4). The most conservative procedure -- and one widely if not universally accepted by historical linguists -- involves the reconstruction by means of systematic multiple comparisons of sound patterns, grammar, and vocabulary of the proto-language, that is, a hypothetical language which through time has diversified to form the known contemporary descendant languages of a linguistic family, stock, or phylum. The best known example involves Proto-Indo-European (PIE) believed to have been spoken "in a broad band over the steppe, forests, and foothills between the western Caspian area and the Carpathians. during roughly the fourth millennium and the first centuries of the third millennium B.C." (Friedrich 1970:1; cf. Watkins 1992b). Indo-European languages believed to have descended from this ancestral speech community include English, Spanish, Russian, Greek, and Hindi, among many others. The prehistoric PIE homeland is located by means of "linguistic paleontology," that is, by reconstructing lexical items in the proto-language descriptive of environmental features restricted to certain prehistoric habitats. PIE was reconstructed with the help of written records over 2,000 years old, but such reconstructions do not depend on such records. For example, Proto-Mayan has been very substantially reconstructed based on comparisons among the 30 contemporary languages of the Mayan family (of southern Mexico and Guatemala) and is thought to date to at least 4200 years ago (Kaufman 1976) and to have developed initially in the highlands of western Guatemala. It has also been possible to reconstruct a set of vocabulary closely tied to Mesoamerican civilizations and to show that these terms originated within Proto-Mixe-Zoque, which was spoken ca. 3,000 years ago in the northern lowlands of the Isthmus of Tehuantepec (Campbell 1979). Proto-Mixe-Zoque is a distant relative of Proto-Mayan (and possibly also of languages ancestral to Sahaptian, as discussed below: Greenberg 1987:143-144). Closer to home, Proto-Salishan reconstructions suggest the ancestral Salishan language was spoken perhaps 5,500 years ago, likely on the streams that drain from the Cascade Mountains into Puget Sound (Suttles and Elmendorf 1963, based on lexicostatistical data from Swadesh 1950). Suttles and Elmendorf, in this same paper, argue that there is a fairly strong association between the historic distribution of the Salishan languages and habitats associated with river valleys that drain into Puget Sound and the Straits of Georgia. This "proto-Salishan habitat" contrasts with the presumed proto-Wakashan habitat on the outer coasts of this region. If such broad environmental associations may be attributed to language families, a "proto-Penutian habitat" could be described as a relatively drier, more open grassland or savannah habitat, such as characterizes the Columbia Plateau, Willamette Valley, and California Central Valley, historically occupied by the core Penutian languages. In short, it is possible to establish linguistic and cultural affiliations between contemporary languages and cultures and those presumed to have existed many millennia in the past. But what are the time limits of these historical linguistic methods? PIE takes us back perhaps 7,000 years. However, alternative if less conservative methods might push such connection back even further. Joseph Greenberg promotes what he calls ". the method of multilateral comparison [of sound-meaning correspondences among the vocabularies of large sets of related contemporary languages, ESH].." He claims that this method, "is so powerful that it will give reliable results even with the poorest of materials. with only 10 languages, even after 10,000 years about 42 percent of the original vocabulary is recoverable" (Greenberg 1987:28-29). Greenberg's method is similar to the linked methods of lexicostatistics and glottochronology (Swadesh 1959). Lexicostatistics involves measuring the percentage of cognates [that is, similar words with similar meanings in two languages where the similarity is attributable to descent from a common ancestral form in an ancestral language, ESH] in "basic word lists." The larger the percentage of cognates, the more recently the two languages being compared are presumed to have separated. Glottochronology extrapolates from the lexicostatistical measure to an estimate of how long ago the languages diverged. It is analogous to the use of C14 dating of organic materials in that a "lexical half-life" is estimated and used to extrapolate to the time the two languages being compared diverged. The method presumes that the basic vocabulary may be used as a sort of clock, on the assumption that basic vocabulary changes at a more-or-less constant rate through time. The method is highly controversial (cf. Bergsland and Vogt 1962, Teeter 1963), though if one controls for the effects of borrowing it is generally conceded that lexicostatistical methods may provide reliable relative ages for linguistic affiliations. Whether or not we accept glottochronology as a valid method for establishing absolute dates, the question remains of its potential temporal range. "Swadesh himself did not consider the method [of glottochronology, ESH] reliable for periods of more than 8000 years" (Greenberg 1987:335). However, Greenberg argues that one may greatly enhance the power of the method of lexical comparison by means of multilateral comparisons (Joos 1964), as noted above, though many historical linguists remain skeptical of Greenberg's claims. However, I will sketch below his model of the linguistic history of the Americas. Greenberg argues that all Native American languages belong to three very large genetic units, which represent three distinct colonizations of the Americas from northeast Asia (Greenberg 1987, Ruhlen 1987). The first -- the Amerind family -- he associates with the "Clovis culture," long believed to represent the first colonization of the New World via the Bering Straits Land Bridge at the end of the last Ice Age, ca. 11,500 C14 years ago (= ca. 13,500 calendar years BP). Greenberg classifies all Native American languages as Amerind with the exception of the Na-Dene and Eskimo-Aleut groups, which he argues represent subsequent colonization events. He associates Na-Dene and Eskimo-Aleut with broad Old World groupings, Na-Dene possibly with Sino-Tibetan and Eskimo-Aleut possibly with Indo-European and Uralic in a grand phylum called Eurasiatic (Greenberg 1987:331-337). Ultimately, of course, Greenberg's goal is to confirm the existence of a Proto-World language, which some suggest may date to ca. 50,000 BP (Wade 1999). Greenberg next recognizes a number of Amerind subgroups. These correspond in many cases with groups proposed much earlier, for example, by Sapir (1929). 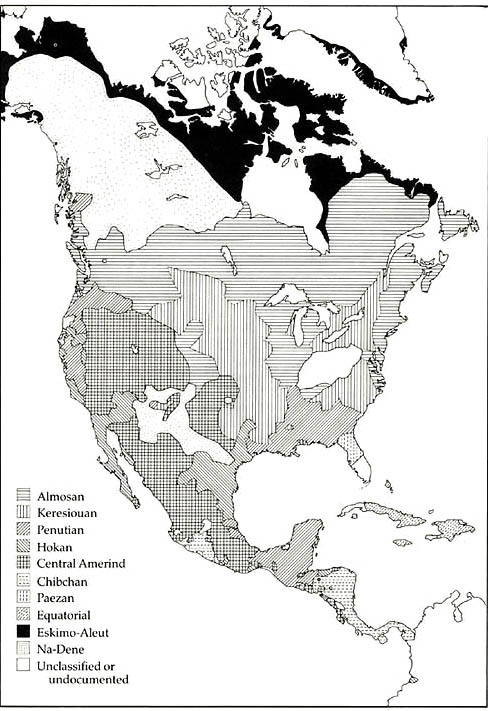 Three such major subgroups are relevant to the present case: "Almosan," "Penutian," and "Central Amerind" (see Map 2). Greenberg's "Almosan" includes the Salishan family, which in turn includes the Interior Salishan subfamily of seven languages. These occupied the northern Columbia-Fraser Plateau region at first contact. He groups Kootenai -- often treated as a linguistic isolate -- within this subgroup. Greenberg's "Central Amerind" includes the Numic language family, inclusive of the Shoshone and Northern Paiute languages spoken on the southern margins of the Plateau. Finally, his "Penutian" includes the languages of the Sahaptian family (Sahaptin and Nez Perce), as well as Klamath-Modoc, first cousin to Sahaptian, and Wasco-Wishram, a Chinookan language spoken downriver from Sahaptin from below Celilo Falls into the Columbia Gorge. The puzzling little-known Cayuse and Molala languages also fit here. One additional language is reported from the Plateau region, Nicola Athabaskan (a Na-Dene language), which is general considered a late intrusion from the north (see also Kinkade et al. 1998). Map 2. Major North American Language Groups, from Greenberg (1987:388). Reproduced courtesy of the Stanford University Press. Can we judge which of these language families is of greatest antiquity along the lower middle Columbia River? Firstly, the Numic languages are distributed in a broad fan-like sweep of territory between southeastern California across Nevada and Utah to southern Oregon, Idaho, Wyoming, and Colorado, with the Comanche (a Shoshonean-speaking group) established on the Great Plains east of the Rocky Mountains. This geographic distribution, combined with assessments of the degree of differentiation within the Numic group and glottochronological inferences, supports the view that these languages expanded from a heartland in southeastern California less than 2,000 years ago (Lamb 1958:99; Miller 1986:100, 102-104). Thus we may rule out Numic or any other Central Amerind language as having occupied the territory in question ca. 9,000 years ago. Map 3. 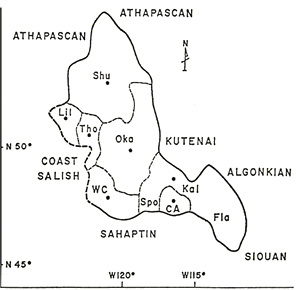 Schematic Distribution of Interior Salishan Languages (Elmendorf 1965). 3. Reproduced courtesy of the Journal of Anthropological Research (formerly Southwestern Journal of Anthropology). Kinkade has analyzed Salishan relationships from a variety of perspectives and is of the opinion that the Proto-Salishan language was spoken on salt-water (1991), which supports Elmendorf's conclusions in broad outline. Rigsby presents comparative and historical linguistic evidence to show that Sahaptin has long been in contact with adjacent Interior Salishan languages: "It is. clear that Sahaptian has been in contact with Interior Salishan for a long period of time, perhaps for several millennia." (1996:142). Thus, the most reasonable conclusion from this evidence is that Proto-Sahaptian was spoken in the central Columbia Plateau before the expansion of Interior Salish, perhaps as early as 4,000 to 5,000 years ago. The close kinship of the various dialects of the Sahaptin language with the Nez Perce language has long been recognized (even by Lewis and Clark). These two languages together constitute the Sahaptian family. Within Sahaptin Rigsby (1965) recognizes 15 dialects in three groups of two major branches: Columbia Sahaptin the most distinct branch, as contrasted with Northwestern and Northeastern Sahaptin divisions of a Northern Sahaptin branch (see also Kinkade et al. 1998:58-61). Applying the principle that the area of greatest contemporary linguistic diversity within a family is most likely the area where the ancestral proto-language was spoken (Sapir 1949), one would conclude that Proto-Sahaptian was spoken along the Columbia River near the mouths of the Snake and Yakima Rivers, that is, precisely where Kennewick Man was found. However, Sahaptin and Nez Perce are quite closely related and likely diverged not more than 2,000 years ago (Nez Perce speakers moving up the Snake River to their historic homeland). What evidence is there for linguistic connections at a greater time depth? A genetic connection between Sahaptian and the Klamath-Modoc language has long been suspected, and this suspicion is well supported (Rude 1986). The position of the extinct Cayuse and Molala languages in this broader "Plateau Penutian" pattern is still not clear (Rigsby 1966, 1969), though it is certain that they do not constitute a "genetic unit" in their own right. However, both are certainly "Penutian," and thus related to Sahaptian at a somewhat greater time depth. Molala apparently occupied a peripheral geographic position within the Oregon Cascade range since well before European contact, well away from our target area (Rigsby 1969:82; Kinkade et al. 1998:62). Cayuse was absorbed via intermarriage and language replacement by adjacent Sahaptin and Nez Perce dialects by the beginnings of the 20th century (Rigsby 1969:73-75; Kinkade et al. 1998:61-62; Zenk and Rigsby 1998). Ancestral Cayuse speakers could have occupied the lower middle Columbia, though it is more likely to have been occupied by speakers of some language ancestral to Proto-Sahaptian and Cayuse. Beyond the Plateau, we find Penutian languages in western Oregon (Kalapuyan languages in the Willamette Valley, etc. ), throughout much of California ("California Penutian"), down the Columbia River from The Dalles to the coast (Chinookan), and represented by the northwestern outlier, the Tsimshian family up along the Northwest Coast to southeastern Alaska. Greenberg spreads the Penutian net wider, to include Mixe-Zoque and Mayan languages in Mexico and Central American (briefly noted above) and the Gulf language family concentrated in the southeastern United States. To date there has not been a systematic attempt to reconstruct Proto-Penutian. Rigsby, however, is convinced of its validity and states that, "It is probable that in Penutian studies we are dealing with a grouping of languages with a time-depth at least as great as that within the Indo-European family of languages" (Rigsby 1969:70). Given the wide range of the Penutian group today, it is difficult to be certain where the Proto-Penutian homeland might have been. However, given the concentration of distinct Penutian subgroups between central California and the Columbia Plateau and the probable predominantly north-to-south movement of early human settlement of the Americas, it is more than likely that Proto-Penutian was spoken in the Columbia Plateau region, perhaps as early as 8,000-9,000 years ago. At least, no other language group can establish as strong a claim as Penutian. In any case, though contemporary Mayan peoples might claim "linguistic affiliation" with Kennewick Man, it is clear that there is no justification to assert a "cultural affiliation," given the fact that the Penutian-speaking ancestors of the Maya colonized Mesoamerican where they participated in the development of Mesoamerican civilization, at a far remove culturally from that of their Proto-Penutian forebears. Sahaptin-speakers, by contrast, retained not only their ancient Penutian linguistic connections but did so without radical core-cultural discontinuities. "thence down the Snake River to its junction with the Columbia River; thence up the Columbia River [past present-day Kennewick, ESH] to the "White Banks," below Priest's rapids; thence westerly to a lake called "La Lac;" thence southerly to a point on the Yakama River called Toh-mah-luke; thence, in a southwesterly direction, to the Columbia River, at the western extremity of the "Big Island," between the mouths of the Umatilla River and Butler Creek; all which latter boundaries separate the above confederated tribes and bands from the Walla-Walla, Cayuse, and Umatilla tribes and bands of Indians;.." (Treaty between the United States and the Yakama Nation of Indians, Article I). In the old days as spring approached and the snows melted, the old people would watch, they would observe that there was snow still on Lalíik. Thus they knew that it would snow again before it got warm. On top of the mountain it might keep snowing and never warm up. That was what they saw. That's all. It is intriguing to contemplate that this legend may record an actual historic event, the great late-Pleistocene Bretz floods (Allen, Burns, and Sargent 1986), which periodically scoured the Columbia Basin between 13,000 and 18,000 years ago. At the height of these floods a huge lake over 1000 feet deep was formed north of Wallula Gap. Map 4 (from Allen, Burns, and Sargent 1986:102) shows how Lalíik would have appeared at that time. One additional detail in this context is the fact that Gable Mountain, which sits on the bench above the bend of the Columbia River opposite the White Bluffs, is called nuksháy, that is, "river otter," in Sahaptin. It is also held sacred as a vision quest site. "The Otter" would, in fact, could have been seen to swim in the Bretz flood waters. Could people ancestral to the present Sahaptin Indians have witnessed these floods, inscribing their memory of that event in their names for a sacred place at the center of their homeland? Of course, a legendary flood is a very common theme of global mythology, of which the story of Noah's ark is no doubt the best known. The linguistic context of the present flood story argues strongly against interpreting it as a biblical borrowing. However, it could as well represent a primal fear rather than a specific historical memory. Map 4. 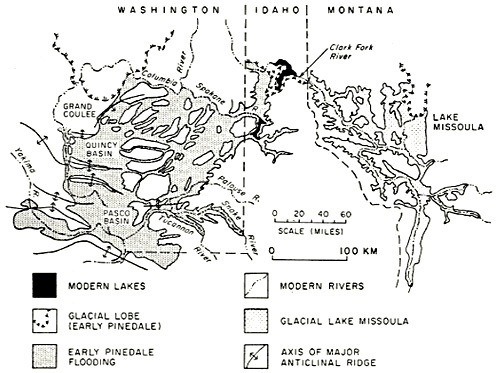 Pleistocene Lake Formed of Impounded Bretz Floodwaters, from Allen, Burns, and Sargent (1986:102). From Cataclysms on the Columbia by John Eliot Allen and Marjorie Burns, © 1986 by Timber Press, Inc. Used by permission. I have summarized linguistic evidence relevant to the question of the cultural affiliation of Kennewick Man with contemporary Native American peoples. That evidence clearly establishes the fact that the Sahaptin language or its direct "genetic" predecessors was spoken in the Columbia Basin 2,000 to 5,000 years ago. This follows from the fact that Proto-Sahaptian may be located in that region, plus the strong inference that Proto-Sahaptian was spoken in the Columbia Basin prior to the expansion of the Interior Salishan languages, which dates initially to between 4,000 and 5,000 years ago. I speculate on the basis of the Penutian affiliation of Sahaptian that Proto-Penutian may well have been spoken in the Plateau as well, which should date to 8,000 or more years ago. However, as there is as yet no reconstruction of Proto-Penutian we cannot determine with confidence whether Proto-Penutian speakers occupied and exploited an environment like that of the Columbia Plateau. However, the geographical pattern of linguistic differentiation within Penutian suggests that the Pacific Northwest, including the Columbia Plateau, is the most likely region of initial Penutian dispersal. In sum, I believe there is a strong possibility that Kennewick Man spoke a Proto-Penutian language. However, I cannot rule out other possibilities, in particular, that the group to which Kennewick Man belonged spoke a language which was not Penutian -- a language now extinct or ancestral to languages spoken outside the present region -- and that the Penutian-speaking predecessors of the historic occupants of this region of the Columbia Plateau either displaced this earlier group or arrived after that group had moved elsewhere or had died out. However, there is no evidence to suggest such an alternative. With respect to the cultural correlates of language, it seems even more likely that Kennewick Man participated in a culture fundamentally like that practiced by the historic Southern Plateau Indians (i.e., those resident south of the Canadian border in east central Washington and Oregon). This follows from the fact that Plateau peoples throughout the intervening millennia made their living by harvesting a diverse suite of local resources, including salmon and other fish, shellfish, a range of roots and berries, and game (Hunn, Turner, and French 1998). As indicated above, extant Sahaptin vocabulary shows how closely linked are language and specific local environmental features. The contemporary Sahaptin ethnobiological vocabulary gives no suggestion whatsoever that the Sahaptin-speaking peoples ever lived elsewhere than in their historic homeland. Furthermore, Sahaptin place names provide a meticulous map of the local territory and clearly indicate a cultural focus on riverine resources, an emphasis that is evident throughout the Plateau archaeological record. However, it is possible that the demonstrated close association between Sahaptin vocabulary and local environmental features could have developed in a matter of centuries rather than millenia, leaving open the possibility that Kennewick Man spoke some non-ancestral language. However, even if Kennewick Man spoke a non-Penutian language, historic Sahaptin-speakers might nonetheless have inherited their "cultural core" of knowledge, belief, and practice with respect to their environmental relationships from the earlier group to which Kennewick Man belonged. Only clear archaeological evidence of cultural discontinuities within this region could suggest otherwise. However, the assessment of that evidence is beyond the scope of my report. In conclusion, I note the legend of Lalíik, a summit that is said to have stood above the waters of an ancient flood. I suggest that this story might link Sahaptin-speaking contemporary residents to a group that witnessed the Bretz ice-age floods, that a "cultural memory" of events long pre-dating Kennewick Man is embodied in the Sahaptin language. (1986) Cataclysms on the Columbia. Timber Press, Portland, Oregon. (1967) "Chopunnish" and "Green Wood Indians": A Note on Nez Perce Tribal Synonymy. American Anthropologist 69(5):505-506. (1994) Nez Perce Dictionary. University of California Press, Berkeley, Los Angeles, London. (1974) The Way It Was: Anaku Iwacha, Yakima Indian Legends. Consortium of Johnson-O'Malley Committees, Region IV, State of Washington, and Franklin Press, Yakima, Wash.
(1962) On the Validity of Glottochronology. Current Anthropology 3:115-153. (1937) Tribal Distribution in Oregon. Memoirs, American Anthropological Association No. 47. (1965) Semantic Structure in Northwestern California and the Sapiir-Whorf Hypothesis. In Formal Semantic Analysis, E. A. Hammel, editor. Special Issue of the American Anthropologist 67, Part 2. (1979) Middle American Languages. In The Languages of Native America: Historical and Comparative Assessment, edited by Lyle Campbell and Marianne Mithun. The University of Texas Press, Austin. (1998) Environment. In Handbook of North American Indians, Volume 12, Plateau, edited by Deward E. Walker, Jr., pp. 29-48. Smithsonian Institution, Washington, D.C.
(1965) Linguistic and Geographic Relations in the Northern Plateau Area. Southwestern Journal of Anthropology 21(1):63-77. (1970) Proto-Indo-European Trees: The Arboreal System of a Prehistoric People. The University of Chicago Press, Chicago. (1962) David Thompson's Narrative, 1784-1812. Champlain Society, Toronto. (1987) Language in the Americas. Stanford University Press, Stanford, California. (1998) Fishing. In Handbook of North American Indians, Volume 12, Plateau, edited by Deward E. Walker, Jr., pp. 620-640. Smithsonian Institution, Washington, D.C.
(n.d.) Why Do Native American Placenames Look So New? Paper presented at the Annual Meeting of the American Anthropological Association, Chicago, Illinois, November 2, 1999. (1973) Flora of the Pacific Northwest: An Illustrated Manual. University of Washington Press, Seattle. (1980) Sahaptin Fish Classification. Northwest Anthropological Research Notes 14(1):1-19. (1982) The Utilitarian Factor in Folk Biological Classification. American Anthropologist 84:830-847. (1991) Native Place Names on the Columbia Plateau. In A Time of Gathering: Native Heritage in Washington State, edited by Robin K. Wright, pp. 170-177. Thomas Burke Memorial Washington State Museum Monograph 7. Burke Museum and University of Washington Press, Seattle. (1996) Columbia Plateau Indian Place Names: What Can They Teach Us? Journal of Linguistic Anthropology 6(1):3-26. (1999) Ethnobiology in Court: The Paradoxes of Relativism, Authenticity, and Advocacy. In Ethnoecology: Knowledge, Resources, and Rights, edited by Ted L. Gragson and Ben G. Blount. University of Georgia Press, Athens. (n.d. 1) Sahaptin Gazeteer. Manuscript in the possession of the author. Department of Anthropology, University of Washington, Seattle. (n.d. 2) Place Names as a Map of the Territory: A Preliminary Analysis of the San Juan Mixtepec Toponymic Inventory. Paper presented at the Annual Meeting of the American Anthropological Association, Chicago, Illinois, November 2, 1999. (1981) Lomatium: A Key Resource for Columbia Plateau Native Subsistence. Northwest Science 55(2):87-94. (1998) Western Columbia River Sahaptins. In Handbook of North American Indians, Volume 12, Plateau, edited by Deward E. Walker, Jr., pp. 378-394. Smithsonian Institution, Washington, D.C.
(1998) Ethnobiology and Subsistence. In Handbook of North American Indians, Volume 12, Plateau, edited by Deward E. Walker, Jr., pp. 525-545. Smithsonian Institution, Washington, D.C.
(1990) Nch'i-Wána, "The Big River": Mid-Columbia Indians and Their Land. University of Washington Press, Seattle. (1929) Northwest Sahaptin Texts. University of Washington Publications in Anthropology 2:175-244. (1931) A Sketch of Sahaptin Grammar. University of Washington Publications in Anthropology 4:85-292. (1934) Northwest Sahaptin Texts, Part 1. Columbia University Contributions to Anthropology No. 19 (English). (1964) Glottochronology with Retention Rate Homogeneity. In Proceedings of the Ninth International Congress of Linguists. Mouton, London. (1976) Archaeological and Linguistic Correlations in Mayaland and Associated Areas of Mesoamerica. World Archaeology 8(1), Table I. (1998) Languages. In Handbook of North American Indians, Volume 12, Plateau, edited by Deward E. Walker, Jr., pp. 49-72. Smithsonian Institution, Washington, D.C.
(1967) On the Identification of the Methows (Salish). International Journal of American Linguistics 33:193-197. (1991) Prehistory of the Native Languages of the Northwest Coast. In Proceedings of the Great Ocean Conferences, Volume 1: The North Pacific to 1600, pp. 137-158. Oregon Historical Society Press, Portland. (1958) Linguistic Prehistory of the Great Basin. International Journal of American Linguistics 24:95-100. (1999) Salmon and His People: Fish and Fishing in Nez Perce Culture. Confluence Press, Lewiston, Idaho. (1984) A Model of Large Freshwater Clam Exploitation in the Prehistoric Southern Columbia Plateau Culture Area. Northwest Anthropological Research Notes 19:97-107. (1986) Numic Languages. In Handbook of North American Indians, Volume 11, Great Basin, edited by Warren L. D'Azevedo, pp. 98-106. Smithsonian Institution, Washington, D.C.
(1988) The Journals of the Lewis & Clark Expedition, July 28-November 1, 1805. Volume 5. University of Nebraska Press, Lincoln and London. (1991) The Journals of the Lewis & Clark Expedition, March 23-June 9, 1806. Volume 7. University of Nebraska Press, Lincoln and London. (1938) Notes on the Tenino, Molala, and Paiute of Oregon. American Anthropologist 40:395-402. (1936) Native Villages and Groupings of the Columbia Basin. Pacific Northwest Quarterly 27:99-152. (1938) Tribal Distribution in Eastern Oregon and Adjacent Regions. American Anthropologist 40:384-395. (1986 ) Drummers and Dreamers. Caxton Printers, Caldwell, Idaho. Originally published in 1956. (1965) Linguistic Relations in the Southern Plateau. Ph.D. dissertation in Anthropology, University of Oregon, Eugene. University Microfilms International, Ann Arbor, Mich., 1980. (1969) The Waiilatpuan Problem: More on Cayuse-Molala Relatability. Northwest Anthropological Research Notes 3(1):68-146. (1996) Some Aspects of Plateau Linguistic Prehistory: Sahaptian/Interior Salish Relations. In Chin Hills to Chiloquin: Papers Honoring the Versatile Career of Theodore Stern, edited by Don E. Dumond. University of Oregon Anthropological Papers 52. Eugene. () Some Klamath-Sahaptin Grammatical Correspondences. Manuscript, Department of Linguistics, University of Oregon, Eugene. (1987) Voices from the Past. Natural History 96(3):6-10. (1921) Language. Harcourt, Brace, & World, New York. (1929) Central and North American Languages. In Encyclopedia Britannica, 14th edition, Volume 5, pp. 138-141. (1949 ) Time Perspective in Aboriginal American Culture: A Study in Method. In Selected Writings of Edward Sapir, edited by D. G. Mandelbaum, pp. 389-462. University of California Press, Berkeley. (1975) Yakima Indian Traditionalism: A Study in Continuity and Change. Ph.D. dissertation, Anthropology, University of Washington, Seattle. (1998) Palouse. In Handbook of North American Indians, Volume 12, Plateau, edited by Deward E. Walker, Jr., pp. 352-359. Smithsonian Institution, Washington, D.C.
(1998) Cayuse, Umatilla, and Walla Walla. In Handbook of North American Indians, Volume 12, Plateau, edited by Deward E. Walker, Jr., pp. 395-419. Smithsonian Institution, Washington, D.C.
(1955) Theory of Culture Change. University of Illinois Press, Urbana. (1963) Linguistic Evidence for Salish Prehistory. In Proceedings of the 1962 Annual Spring Meeting of the American Ethnological Society, Symposium on Language and Culture, pp. 40-52. (1950) Salish Internal Relationships. International Journal of American Linguistics 16:157-167. (1959) Linguistics as an Instrument of Prehistory. Southwestern Journal of Anthropology 15:20-35. (1963) Lexicostatistics and Genetic Relationship. Language 39:638-648. (1928) The Middle Columbia Salish. University of Washington Publications in Anthropology 2:83-128. (1986) Renegade Tribe: The Palouse Indians and the Invasion of the Inland Pacific Northwest. Washington State University Press, Pullman. (1871) Primitive Culture. Harper, New York. (1999) Genes Tell New Story on the Spread of Man. New York Times, December 7, 1999. (1992a) Culture History and Historical Linguistics. In International Encyclopedia of Linguistics, Volume 1, William Bright, editor in chief, pp.318-322. Oxford University Press, New York and Oxford. (1992b) Indo-European Languages. In International Encyclopedia of Linguistics, William Bright, editor in chief, pp.206-212. Oxford University Press, New York and Oxford. (1998) Molala. In Handbook of North American Indians, Volume 12, Plateau, edited by Deward E. Walker, Jr., pp. 439-445. Smithsonian Institution, Washington, D.C.